June is the time to plant warm weather grass seed. According to Kansas State University, June is the best time for planting all warm weather grasses and applying the recommended amounts of starter fertilizer. Types of warm weather grasses to plant in June are Bermuda grass, buffalo grass, bluegrass, ryegrass and tall fescue. You can also over-seed warm weather lawns at this time of year as well. The extra seed will aid in choking out any unwanted weeds that may be taking over the existing lawn area. Consult the seed package labeling for over-seeding rates to existing lawns. Conduct a soil test for the grass planting area. Collect soil samples from several areas around the grass planting site. Mix the soil together. Allow the soil to dry thoroughly. Send the soil sample to your local agricultural extension service to conduct the soil analysis. Contact your local extension agent for any particular processes and procedures for soil testing. Amend the soil with the recommend amounts of lawn fertilizer and agricultural lime. Follow the analysis results for an economical application of the required nutrients. Work the surface of the seedbed and the applied nutrients into the soil with the rototiller to a minimum depth of 6 inches. Smooth the soil with the garden rake. Remove all rocks, organic debris such as roots and old plant material. Broadcast the warm weather grass seed at the recommended seeding rates on the package labeling. Bermuda grass, bluegrass and buffalo grass will be seeded between 1 lb.to 3 lbs. per 1,000 square feet. Tall fescue and perennial ryegrass will be seeded at 6 to 8 lbs. per 1,000 square feet. Amounts will vary due to factors such as soil condition and slope of the seed planting area. Rake the seed into the soil using the tines of the garden rake. Some seed will remain exposed. Irrigate the new grass seed immediately. Soak the seedbed thoroughly using the garden hose and the sprinkler attachment to several inches deep. Keep the seedbed moist with light sprinkling. You may have to apply water several times a day during extremely warm and sunny days. 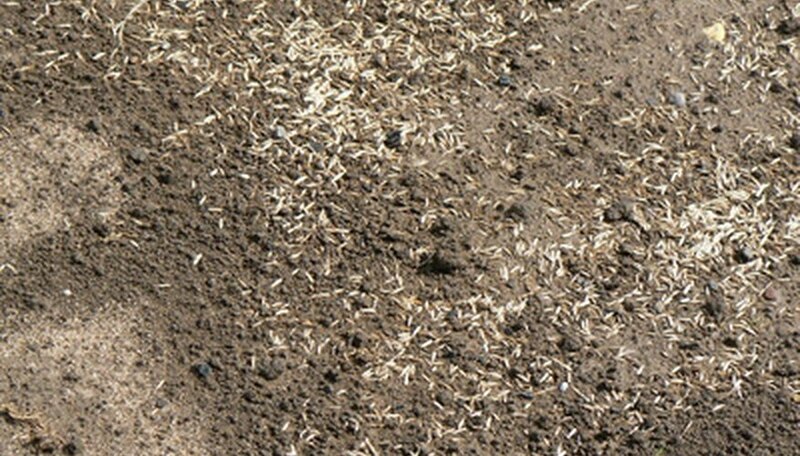 Once the grass seed germinates, do not allow the young seedlings to dry out. Adding extra fertilizer to the new growing grass may be tempting, but adding more fertilizer than the soil test results indicate will burn the tender roots of the grass plant.